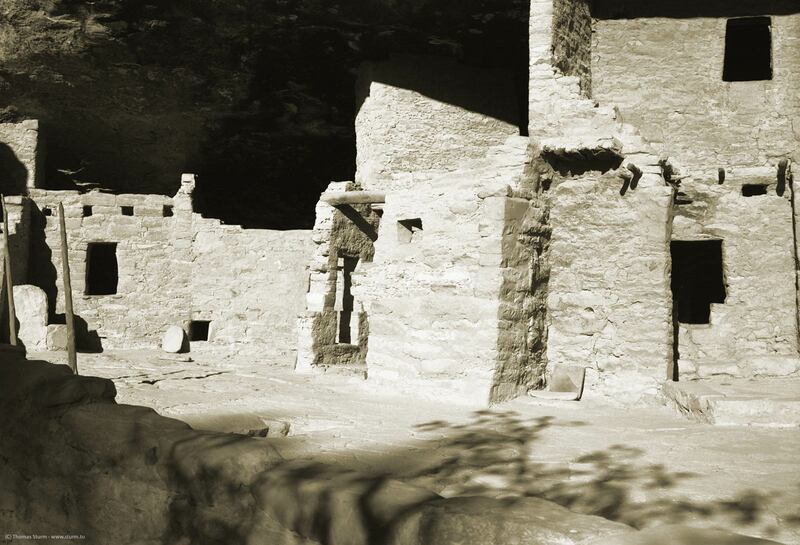 I've posted a different photo from the Spruce Tree House in the Mesa Verde National Park before, but during my recent re-scanning campaign I found this very nice shot of the same place. I have fond memories of our stay in Mesa Verde. It was late in the season and some of the sights were already closed in expectation of winter. The park was nearly deserted with only a handful of tourists on the loop road and small groups of deer strolling freely along the roads and parking areas. The Indian ruins in Mesa Verde are simply stunning. Most of the little communities were built into naturally hollowed out areas along the cliff faces in the steep canyons that run through the mesa, and many of them are hard to reach even with ladders and metal stairs in place of the old climbing paths that the original inhabitants used.